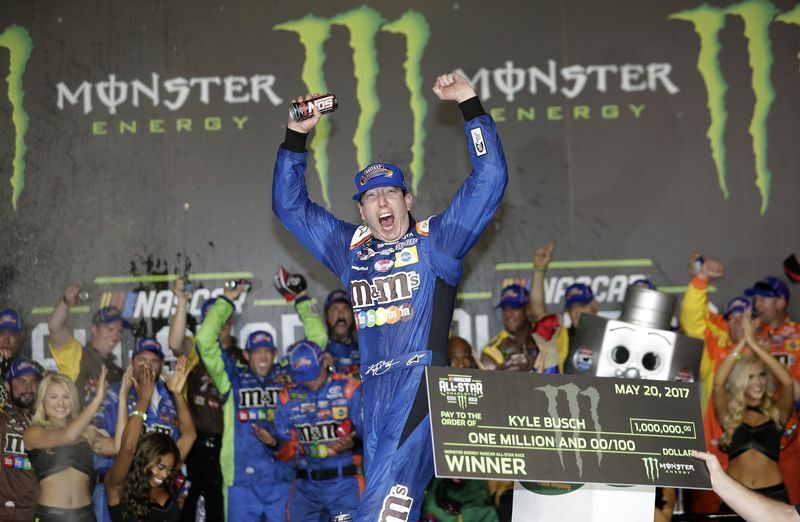 It took Kyle Busch 12 years to win the Monster Energy All-Star Race at Charlotte Motor Speedway, but one move on Brad Keselowski in Saturday's final segment did the job. Busch passed Brad Keselowski and Segment 3 winner Jimmie Johnson on the Segment 4 restart and pulled away to become the 23rd driver to win an All-Star Race. Busch prevailed over polesitter Kyle Larson - who dominated the first two segments, but restarted fourth for Segment 4 after Keselowski did not pit. Busch's victory, coupled with his win in Friday's N.C. Education Lottery 200, made it a weekend sweep. Johnson finished third with Kurt Busch fourth and Jamie McMurray fifth. Kevin Harvick, Chase Elliott - the Monster Energy Open Fan Vote winner - Joey Logano, Keselowski and Denny Hamlin rounded out the top 10. Fan favorite Dale Earnhardt Jr., the 2000 All-Star Race winner, finished 18th in his final All-Star start. KYLE BUSCH, No. 18 M&M's Caramel Toyota (Winner): "It's the All-Star Race for one and for two we've never won at Charlotte in a Cup car so we've achieved that goal tonight. I can't say enough about this team and everybody on this M&M's Caramel Camry. First race, first win for (M&M's Caramel). I can't say enough about (crew chief) Adam Stevens and the guys on this pit box. We weren't quite the fastest car but we made the right changes when it mattered most and we made the right moves when it mattered most. … It means a lot, first of all, to finally win at Charlotte and to win the All-Star Race. 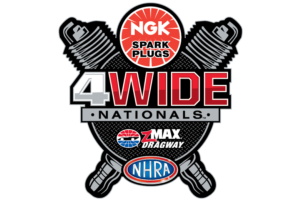 … Taking home a million bucks, that's not such a bad payday, even though I know (car owner) Joe (Gibbs) takes home most of it. A good night for us overall." KYLE LARSON, No. 42 Target Chevrolet (Runner-Up): "We had a dominant car most of the race. We just struggled on that last stop. The jack stud broke off somewhere through the race so it was harder to pump the car up. We got beat off of pit road by two or three cars. That was kind of the difference in the race for us. We had a lot of speed on that last restart but couldn't get back there. So we wound up second. We wanted to win the All-Star Race and it didn't work out that way." JIMMIE JOHNSON, No. 48 Lowe's Chevrolet (Third-Place Finisher): "I feel like the racing got better as the night went on. Our car was performing well. It was fun with the strategy, in putting those softs on, knowing I could drive like a maniac for a handful of laps. That put us in a good position in Segment 2, then we won Segment 3. I really felt like we were in a great situation, even though I didn't have control of that final restart. I thought Brad (Keselowski) would really be able to hold back that inside lane, and I would be able to at least clear him through the center of one on two on newer tires. ... I was nervous when I saw that, saw that the 2 stayed out. Then I knew he would take the inside on old tires. I honestly felt like I was going to have it under control, but the 18 (Busch) somehow got inside of the 2. That was kind of it for us on the win."